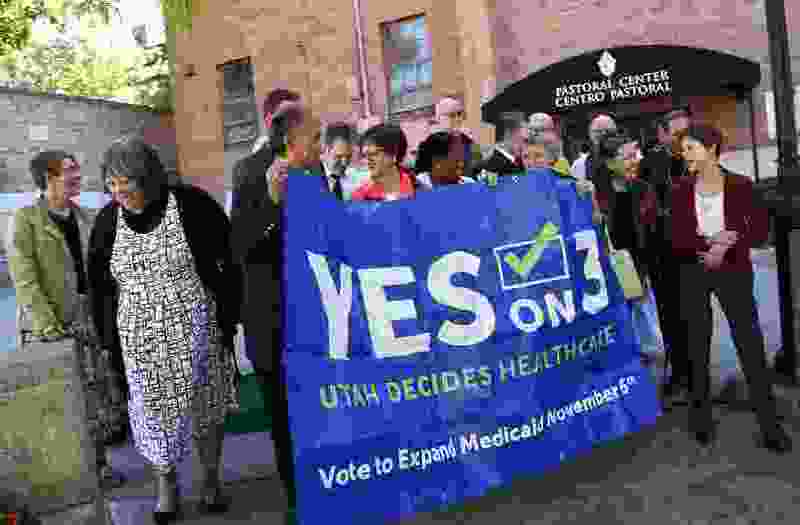 On your ballot, you have the opportunity to join me in expanding health care access to 150,000 hard-working Utahns by voting yes on Proposition 3. We can improve health outcomes, reduce uncompensated care costs and generate over $1.7 billion in statewide economic impact when we bring our tax dollars home. Currently we have a system where a health problem can easily cause someone to lose their job and their health insurance. Most of us can remember a time when we didn’t have coverage or have family members or friends who went through difficult times due to the financial burden of illness. Prop 3 increases health care access for these Utahns. As a lawmaker, I believe Proposition 3 makes sense. There have been over 200 studies done on the impact of Medicaid expansion in the 33 states that passed legislation similar to Proposition 3. The Kaiser Family Foundation has consolidated key findings from these studies and found that Medicaid expansion presents an opportunity for gains in health insurance coverage, improvements in access and financial security for new recipients, and economic benefits for states. They found that Marketplace premiums are on average 7 percent lower in expansion states. When uninsured individuals wind up in ER rooms, they’re almost never able to pay their own costs — which are then transferred to all of us who have insurance. Expansion reduces this problem and lowers premiums for all of us. Prop 3 will also result in state savings by offsetting state costs in other areas, including behavioral health, crime and criminal justice and Supplemental Social Security Income. Ohio, Kentucky, Michigan and Colorado all saw $10 million to $19 million in savings to their criminal justice budget after expansion, because inmates with substance abuse and mental health problems who complete their sentences but don’t get treatment for their underlying problems have much higher reincarceration rates. As a practicing primary care physician, I hope it passes. I remember a patient who was an electrician who developed multiple sclerosis. As he slowly lost feeling in his fingers, he eventually became unable to safely continue doing electrical wiring. Eventually he lost his job and applied for disability. During the two years that it typically takes to be declared disabled, he was still considered “able bodied” by the state, and as such was not eligible for Medicaid, and so was not able to see a neurologist or get medications he needed. I’ve seen patients who can’t afford asthma medications, and people who are skipping treatment for their depression — all because they don’t have insurance and struggle to scrape together enough money to get treatment on a cash-pay basis. Expanding our Medicaid program isn’t free. But we’ve been paying into this program for five years, and not getting our fair share of our tax dollars to cover medical needs in our own communities. By passing Proposition 3, we will get $9 back for every $1 raised by a sales tax increase of 0.15 percent on non-grocery items. By triggering this federal match, we can bring home over $800 million in federal funding every year from Washington, D.C.
Budget challenges related to health care are universal, in both expansion and non-expansion states. But none of the 33 expansion states have stopped offering coverage to this population — because they believe it’s the right thing to do and because the benefits that they have seen in their communities are worth the state money that they have had to spend. Other states have made this work, and we can make it work here in Utah as well. I hope you will join me in voting yes on Proposition 3. (Rick Egan | The Salt Lake Tribune) Rep. Raymond P. Ward asks Rep. Brian Greene questions about HB 185, in a committee meeting, Friday, Jan. 26, 2018. Raymond Ward, M.D., Ph.D., represents District 19 in the Utah House of Representatives.